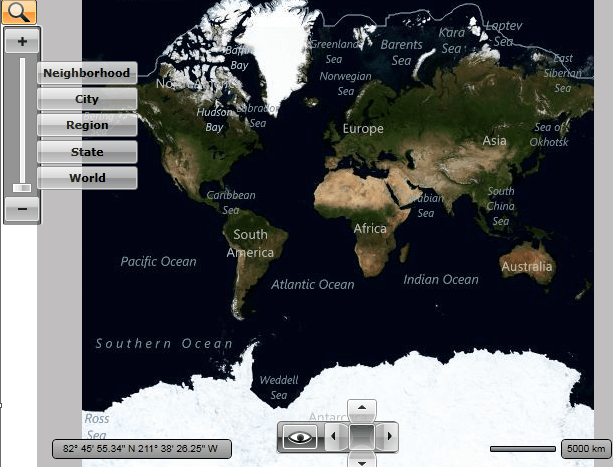 The RadMap allows the user to zoom in and zoom out the content of the map. This is done via the Zoom Bar control in the Commands Bar panel. By clicking on the button with an icon representing a magnifier, the user is provided with different options to zoom in and zoom out. The main tool is the slider which allows the user to slide between the maximum and minimum zoom level. Together with the slider there are several zoom presets, which represent different ranges from the slider. To change the zoom level programmatically you can change the value of the ZoomLevel property of the RadMap. To disable the mouse wheel zooming just set the IsMouseWheelZoomEnabled property to False. To disable the user from zooming, set the ZoomBarVisibility property of the RadMap to Collapsed. Additionally you have to disable the default zooming performed on double click or mouse wheel. To do this, set he MouseDoubleClickMode to None and the IsMouseWheelZoomEnabled to False. 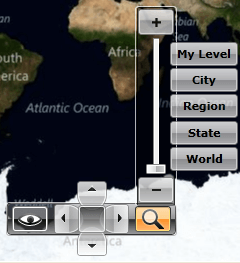 Note that the UI control is represented by the MapZoomBar control. You are able to use it outside the RadMap and place it somewhere around it. In this case you have to either hide the original one by using the ZoomBarVisibility property of the RadMap or the UseDefaultLayout one. Setting the UseDefaultLayout property to False will hide all of the UI controls inside the RadMap. To learn more read here.